Do your kids love fun, exciting, pet movies? If so Robo-Dog Airborne is the perfect movie! We try to do at least a family night one night a week. This week we watched Robo-Dog Airborne! My husband and I really enjoyed the movie and my kids were wild about Robo-Dog it makes the perfect Easter basket stuffer! Be sure to get your copy on amazon here and enjoy all the fun Robo-Dog Airborne brings to your family! Find out more below! and enjoy this free printable with your kids! “Go fetch” reaches new heights when Robo-Dog: Airborne arrives on DVD, Digital HD and On Demand on March 14 from Lionsgate. When the world’s most advanced K-9 loses his family and his memory chip, it’s up to his best friend Tyler and his scientist dad to find Robo-Dog and bring him home! In this sequel to 2015’s family film Robo-Dog, Robo-Dog: Airborne “is encouraging and inspirational for young and old alike” (The Dove Foundation). Awarded the Dove Family Seal of Approval, the DVD features limited-edition packaging, the “Ruff Cut: Behind the Scenes of Robo-Dog: Airborne” featurette, and TV’s “Minuscule” bonus episodes. 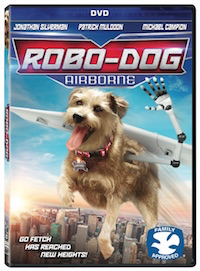 The Robo-Dog: Airborne DVD will be available for the suggested retail price of $19.98. Making it an affordable Easter gift! Meet Robo-Dog, the world’s coolest pet. He can run super-fast, grow a bionic arm, talk, and even fly! After creating the perfect pooch for his son Tyler, genius dad Tom (Patrick Muldoon, “Days of Our Lives”) gets called away. When Tyler and his wacky nerd friend Barry head off to a science fair, Robo-Dog runs away and has his memory chip erased. After starting a new life with a computer whiz and his adorable daughter, will this high-tech terrier ever find his way home to his rightful master?